Message From the President – Doublecross!! Saturday, July 1st is right around the corner. Why is that important? It’s the date of the Doublecross! 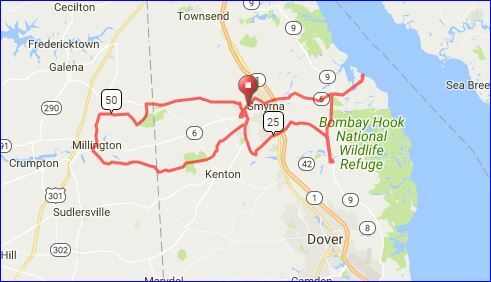 The Doublecross Metric Century, one of the Club’s four major events (Icicle, Doublecross, Shorefire and Savage) is being held this Saturday in Smyrna, Delaware. If you are wondering how the Doublecross got it’s name – it is a ride that travels 62 miles and traverses the entire state of Delaware twice within those 62 miles. The route that this event follows has changed over the years, but those routes have always held to that one parameter – crossing the state twice. Leaving from Smyrna High School, the route will follow flat, scenic bicycle-friendly roads in southern New Castle County. First heading heading east to Woodland Beach on the Delaware Bay the route will be at its eastern most limit before turning back to the school to finish the first of two 31-mile loops. The route continues now heading west crossing the trans-peninsular line that is the state boundary between Delaware/Maryland before looping back to Smyrna High School to finish a 62-mile, 1,000 kilometer Metric Century loop. Most Important – Enjoy the ride! The weather forecast as of Thursday morning looks favorable for this event, with temps in the upper 70’s and 80’s, humidity at around 70% and party sunny conditions. Please remember that the Club’s four major events are fundraising events. Profits from the money that is raised during the year is donated to cycling-related non-profits to fund their initiatives. Your registration fees will make a difference in the cycling community, some that may benefit you, some that will benefit those that may not have the means to enjoying the sport that we love without assistance. Our Club gives back to the community, please be a part of that. I’ll be there Saturday, I hope to see you there as well. ← Message From the President – It’s Hot, Drink Up!